For some reason, I've had the hardest time finding a recipe for slow cooker oats. I mean, they're all over the place, but whenever I try them, I either A) don't like the flavor, or B) don't like the consistency. Blah and mush aren't my thing when it comes to breakfast. Especially if breakfast is oatmeal. So this month, I vowed to finally find a recipe that works. I did one last search for "slow cooker steel cut oats" and landed on something that looked promising. After a few small tweaks, at around 10:00PM on Friday night, I poured all of the ingredients into my slow cooker and hoped for the best. I woke up to a pot full of awesome around 6:15AM the next morning. Of course, I switched the slow cooker to "warm" and headed back to bed. Slow cooker steel cut oats with brown sugar and blueberries. Plus bananas and PB2 with a splash of milk. And, OHMAN, did it taste good! Finally, slow cooker oats that weren't worthy of the garbage disposal! I mean, at least in my opinion. If you want to develop your own opinion, here's the recipe I ended up using. 1) Combine all of the ingredients in a slow cooker set to "low." Stir, and let cook for eight hours. 2) If you aren't eating it immediately, turn the slow cooker to "warm" until you are ready to serve. 3) Top with a sprinkle of brown sugar and blueberries...and anything else your heart desires! I added a splash of milk to mine, some banana slices and a small spoonful of PB2. You seriously can add whatever you want. The base oats are flavored, but not overpowerfully so, so you've got room to add in more flavor. Although, they are quite tasty plain. I would know, I sampled a spoonful or two in the middle of the night when...since I was already getting up to use the bathroom (#pregnancyproblems)...I opted to check on things. Note: This recipe makes a ton! I ended up putting four small servings in the 'fridge, and freezing four more for later. Reheated, they tasted just as good, but were a bit gummy. Nothing a splash of milk couldn't fix, though. And now, I can't wait for breakfast. 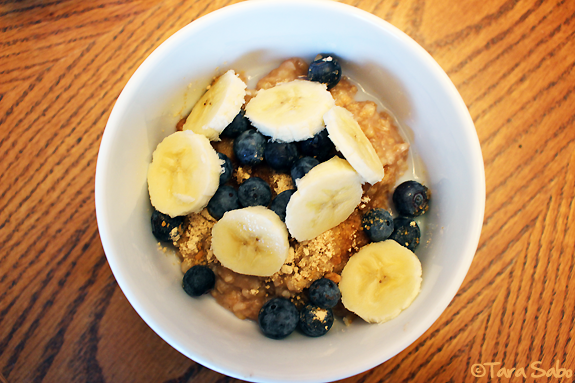 Question: What's your go-to when it comes to topping a bowl of oats? Totally going to try this! I just started eating steel cut oats for breakfast. I have a smaller crockpot so I might halve the recipe to be safe. Thanks for sharing! I'm not sure how much water your pot holds, but it shouldn't boil over or anything...and it should work just fine if you half everything. Lemme know what you think!